1 - 3 $770.59 ea. 4 - 7 $752.88 ea. When accuracy counts (and really, when does it not? ), the familiar Pacific Scientific T5 Tensiometer from SkyGeek should be your go-to choice. The T5 Tensiometer is a low cost, highly accurate, precision instrument that is capable of providing cable tension readings over a wide range. It has a simple dial interface that allows users to read cable tensions at a glance and can measure anywhere from 10 to 150 pounds of tension with ease. Each T5 instrument is carefully calibrated by expert technicians at the factory before being shipped and is provided with its own calibration chart for the simple conversion of readings into pounds of tension. The charts also indicate the riser, which must be used to accommodate the various cable sizes and tensions. The Pacific Scientific T5 Cable Tensiometer from SkyGeek is a small, lightweight, precision instrument that every aircraft mechanic should have in their toolbox. 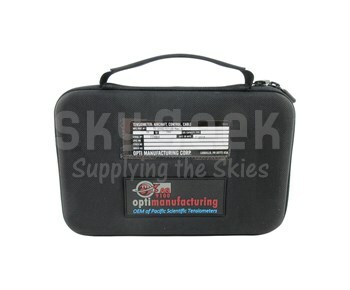 The straightforward design is easy to use and is durably constructed for a long and accurate service. The tensiometer is priced low and is a great addition to your routine maintenance supplies. The tensiometer is designed with modern mechanics in mind and includes a rugged housing that allows the piece to be used in the field without worry. It arrives pre-calibrated for convenience and will not need additional calibrating before use. Order your Pacific Scientific T5 Tensiometer today for the best price and fast shipping. Get more accurate readings and better reliability for less by shopping at SkyGeek. Need documentation? Add a manufacturer�s certification to your order for a small additional charge. If you happen to be ordering several tensiometers, volume pricing is also available. ACCURATE AND RELIABILITY: There is no temperature error in a Pacific Scientific Cable Tensiometer. No preliminary adjustments on the are necessary. This durable instrument may be used continuously without resetting or checking. Extreme heat or bitter cold does not affect the accuracy of indicator readings. One instrument is usable on many cable sizes with absolute accuracy. Small Size: The small size of this instrument permits entry through small openings, and permit accurate readings on cables located in confined areas difficult to reach. Easy To Use: The entire operation of testing cable tension can be done with one hand in a matter of seconds. Secondary Control Cable Tensiometer:Practice has proved that improve accuracy of readings is obtained, and the safety factor improved when the service operator is provided with two Tensiometers. One for high tensions, and particularly one for secondary control systems, where low tensions predominate.